Pssst….I have a secret. Do you want to know how to occupy your kids for an hour without them looking at a screen. Yes, it’s possible. 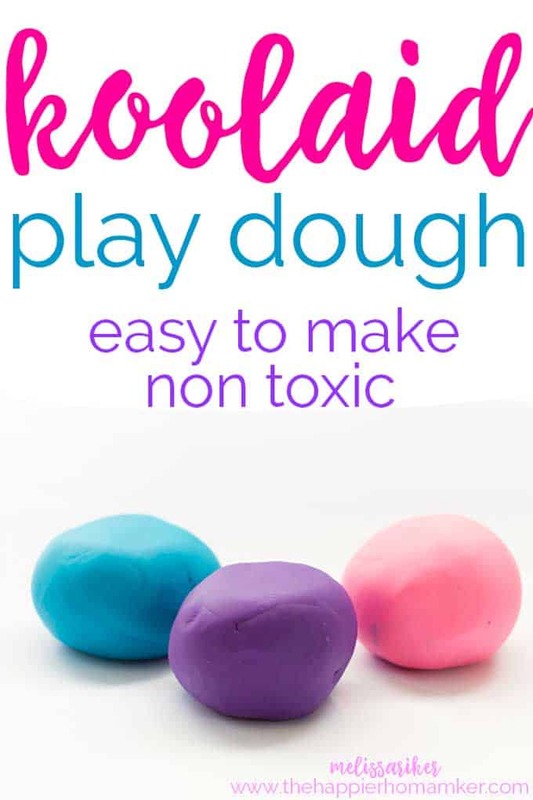 Simply ask them if they want to make this easy homemade KoolAid play dough! That’s what I did with my three boys last week when the rain wouldn’t stop and it was a huge hit-it bought me tons of Mommy time while they joyfully made pizzas, snakes, etc and occupied themselves. It was glorious! 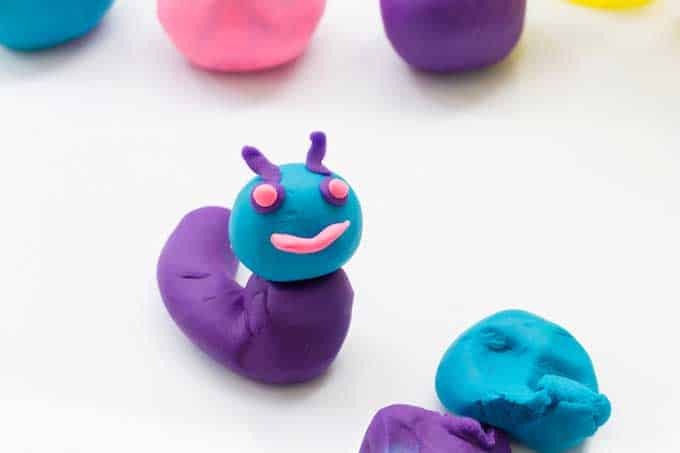 This play dough is very easy to make-the kids can help, just be careful of the heat and make sure they let it cool down a bit after you take it off the stove so no little hands get burned. It’s easy to switch the colors up by changing out KoolAid flavors and you can get more intense coloring if you double up the KoolAid as well. the pan will be much easier to clean if you let it soak in water for about 10 minutes before cleaning-trust me on this one! I have not found this to stain hands or surfaces (which was a big concern for me when I first tried it) but I can’t say that I’ve tried all the different flavors of KoolAid over the years so I recommend testing it first just to be on the safe side. Mix the all ingredients in a small pan. Heat over medium heat, stirring constantly. 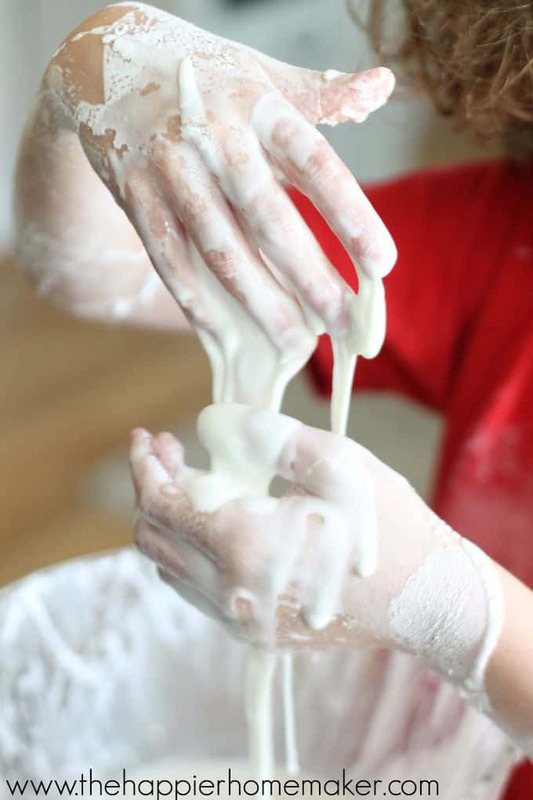 When the dough becomes a ball remove from heat and allow to cool. Knead the dough until it’s uniform. Store in an air tight container. My 3yr old Grandsons is going to love this recipe! Not so sure about my Daughter-in-law, but I know that she will enjoy trying it with him. Thanks for making our day! I am definitely going to try this, but one quick question- where’s the KoolAid? ? I think that you accidentally omitted it from your recipe. I’m assuming that you add one packet to the mix? Anyway, Thanks for the great idea! ? The Kool Aid is there, It says……•Kool Aid packet of your choice-use more than one packet for a more intense color……. So that means use one pack of Kool Aid and if you don’t think that is bright enough then use two. Use 1 packet, 2 for more intense color. I can’t believe that there’s no way to Print this off….so that you can take it to your kitchen?….DUH! Yes there is. High light text and right click, copy and paste to a word document.